"...However, the heart of this production is the superb performances under the direction of Michele Shay, a veteran Wilson performer and director who was nominated for a Tony for her 1996 performance in Wilson's "Seven Guitars." The actors give such towering performances that to single one out for praise would be a fool's errand. They are an ensemble in the truest sense of the word - a family of equals who support one another generously and magnificently." "...After producer Sophina Brown's celebrated production last year of King Headly II - one of ten dramas of the late August Wilson's 2oth-century chronicle The Pittsburgh Cycle - she staked a claim to produce the entire oeuvre. Her promise is Los Angeles's gift. Opening last weekend at the Matrix Theatre, Two Trains Running, a 1992 Pulitzer-Prize nominated time capsule, still entangles us today with director Michele Shay's riveting production. As much a warning as a matter of memory, the inequity that Selma couldn't end and that Ferguson continued is center stage for nearly three highly rewarding hours." "...August Wilson's Pulitzer Prize-nominated Two Trains Running arrives at the Matrix just in time for Black History Month in as powerfully staged and performed a production as any theatergoer, regardless of color, could possibly wish for." "...When I look at this play, that is what I come away with. Hope in all its terrible sweetness, a siren voice which brings disappointment even heartbreak, yet not always. As addictive as a drug, save this drug sometimes turns out to be medicine. Actually, that was what drugs were invented as, right? At play's end, I myself feel so much hope for all these people--and most of all maybe for Risa, whose backstory we never learn yet by the power of words and performance and staging we feel as wildly real." "...The play is permeated by a sense of the injustices that black people have suffered at the hands of whites, and the feeling that the time for putting up with it is over. 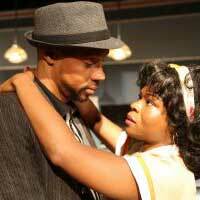 But the undying glory of the play is August Wilson's gift for crafting great dialogue. The brilliance of Michele Shay's direction lies in setting the actors free to explore every nook and cranny of their characters' emotional ramblings. The result is an explosion of theatrical artistry, abetted by John Iacovelli's pitch perfect scenic design, Mylette Nora's costumes, Brian Gale's lighting and Jeff Gardner's sound." "...Under the flawless direction of Michele Shay, this ensemble of superb actors is sensational, infusing the action with energy and monumental heart, bringing August Wilson's words, with its built-in rhythms and emotions, to extraordinary life." "...Two Trains Running is highly recommended, a truly remarkable production that should be seen by as many people as possible."